Caroline, can you please share with us your background before yoga? Looking back feels disorientating. I barely recognise the girl I was before I started this practice. She was academic, loyal, loving, blessed with good friends but also fragile and scared. She did well at school and went on to do well at university. A relationship dissolved, some poor decisions based on assumptions of ‘success’ led her into a corporate world which never fitted. Deep dissatisfaction manifested in anxiety and disordered eating. Thankfully the gym that offered body pump, spinning and treadmills also offered yoga, which turned out to be a class by Authorised teacher Rowena Warren and based on the primary series. After that class I floated home: my mind felt like it was on pause. The internal stream of criticism that had become so normal vanished, if only for a short while. I craved that silence. I went back to the class once, twice, three times a week. In October 2006, having quit the soul-destroying job, I travelled to Thailand for an Ashtanga yoga retreat with Jeff and Harmony Lichty. They explained more about the Ashtanga method and kick-started a daily practice which I’ve maintained ever since. And they told me unequivocally to get myself to Mysore, pronto. So I did. You touched upon your mind “pausing” when you practiced. It sounds like the practice was a therapeutic healing vehicle for you. This appears to be a common thread in so many practitioners. What is it about the practice that allows people to find healing? The practice heals, there is no doubt. I’m not sure about picking it apart to figure out how. At a guess, major aspects for my own - ongoing - recovery include: the daily discipline; the particular sequence of movements combined with deep steady breathing; experiencing a connection to something bigger than the self. And, crucially, the teacher/student relationship. This has provided me with an opportunity to stop thinking or analysing, stop making decisions, to simply trust and do. The relationship I have with my teacher is immensely freeing. For me, this has created the space I craved and has been the basis for ongoing healing. Can you share with us how India and your experiences at KPJAYI affected you? Going to Mysore as a complete beginner was the best decision I could have made. 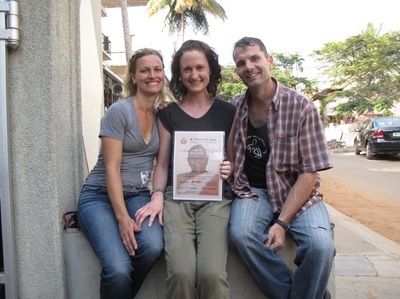 I arrived at the shala in January 2007: it was super busy, accommodation was hard to find, the shala was so full. Sharath came into the lobby and told me “the shala is full, no more space, too many students”. I replied: “but I came all this way?” He suggested I practice with him at his shala instead, and I gratefully agreed. I arrived - for my 11.45am start time! - sick with nerves, clutching my mat. Sharath’s shala was small, maybe 25 mat spaces, and as I entered the room he gestured for me to sit next to his chair and wait. A spot came up in the front row, he told me to put my mat there and asked “You know suryanamaskara?” I nodded yes, and off I went. I was not - am not! - a natural at asana. I was very stiff, very weak, the mind was negative and flighty. I practiced up until marichyasana B, as Harmony had taught me, then stopped and looked up. He nodded and told me to lie down: “backbending”. I did my ‘baby’ backbends, only lifting my hips off the floor and interlinking hands underneath me - I was unable to move my arms and hands back into the correct position or push up into urdhva dhanurasana at that stage. I continued practicing in this way for three months. Slowly, very slowly, my practice got a little longer and I enjoyed it more and more. I loved being in the room with Sharath. I felt him watching me and he would help me all the time. Once a week we had led class in the main shala and he would be right next to me for asanas where I struggled. I felt very safe and fully supported. A few times we had to join the main shala students for led with Guruji. He counted SO fast! I’d feel immensely grateful to get to my last posture and watch those around me carry on to the end. This was my first experience of seeing and hearing the count of primary series in it’s entirety. Studying at KPJAYI is an important part of learning, and maybe eventually teaching, Ashtanga. It connects a student to the birthplace, the home, the very heart of the practice. Even just getting there and existing day to day is a practice in itself - it will test your patience, resilience and courage every step of the way. Nowadays it’s a little different - so much information is online, on google, so many blogs - but I don’t believe this eliminates the lessons. They will just emerge elsewhere. Sometimes the lesson is obvious, sometimes less so. Common themes - for me at least - seem to be courage, strength, surrender, simplicity. Mysore is never a holiday. I spend a good proportion of my time there feeling raw, fragile and flattened out. I have learned to be very careful where and how I spend my time or I can feel depleted very quickly. All these are lessons in yoga. The annual pilgrimage to Mysore is undoubtedly the most important time in my year and maybe the first was the most significant: not only did I find my teacher, but a few days before we flew home I found out I was pregnant with our first child. What a blessing to have Sharath as your teacher from the beginning. Has this experience with him as your teacher influenced your own style of teaching? Can you also please share about others that you have learned from and their impact on you? Learning the practice from Sharath, in Mysore, has affected me so deeply. I don’t think I can begin to articulate how much it means to me. And now I have his blessing to teach, I do my absolute best to do so as close to my own experience as I am able. I’m so grateful to him and to Guruji for dedicating their lives to teaching us all. I think of them every day, especially when I stand in front of the class to chant, and am constantly inspired by their dedication and commitment. Whenever I see a student who is similarly stiff and weak, or perhaps suffering mentally and emotionally as I was, I really understand how they feel. I WAS that student, stopped relatively early in primary whilst the rest of the room finished, who wobbled all over the place in utthita hasta padangusthasana, who had painful knees, immovable hips and stiff shoulders, who took years to figure out how to drop back and stand up from a backbend, who constantly beat myself up. But now I’m not. I know how powerful daily practice can be. I know for sure because I have lived through it. Daily practice has changed me, and continues to do so. Occasionally I get a flashback to those old thought patterns or behaviours - it feels like a different life, like it’s not even me. I want every student who comes to my shala to experience this transformation. The asana is a tool for life, becomes a metaphor for life, feeds back information about activities that nourish or destroy us. We get the chance to see, listen, and ultimately to change. Or not. It’s up to you. The only teacher other than Sharath with whom I’ve spent significant time is Hamish Hendry. For me, there is barely any separation between the two. Even walking into AYL feels like the Mysore shala; the way they teach, with minimal interference, strong focus and full kindness has meant I thoroughly enjoy practicing with them both. 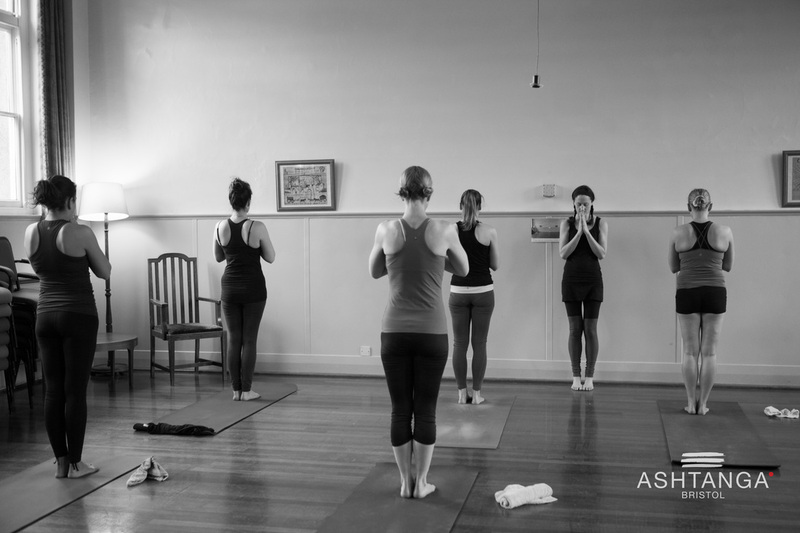 Ashtanga yoga presents us with a clear system for health of body, mind and spirit: the teachers are carrying it onwards, holding a space where students can practice. I have had a number of female practitioners ask if teachers could provide guidance on approaching pregnancy and practice. Do you have any advice? Go to a teacher who has practiced whilst pregnant, or one who has experience in guiding pregnant students. It’s no different to the rest of the practice: the only way one can teach is through direct experience. My time with Hamish helped me figure out how and what to practice in both my pregnancies. His support gave me the confidence to trust myself and my instincts - what to do, when to rest, when to work. I want all my students to enjoy their practice: relish the time to themselves, use it therapeutically. Pregnancy is a free pass to skip anything that doesn’t feel right and chill out. Trust me, you want to take it! How can mothers that are raising young children set supportive conditions to support their practice? Rest well. Eat well. Be disciplined. Make practice a priority. Get support. Mutually agree a time with your partner when he can practice, or go running or swimming or climbing, and stick to it. You must have each others back during the early childhood years. Help each other get to the mat, or have some other time to yourselves. Be a positive enabler. As a mother there is no shame in putting yourself first. Quite the contrary: I believe you have to prioritise your own mental and physical health in order for your children to do the same. Live a life you would be proud for them to live. Choose to be disciplined in your thoughts and actions, choose to invest time and money in your health. I’m a better mother, wife, friend and teacher when I have practiced; when my body and mind are comfortable, peaceful places to be. When they weren’t, I was miserable. I want my children to feel comfortable in their own skin. I always do my practice. It’s too valuable to skip. Ashtanga is a physical practice. Do you have any thoughts on practitioners that find themselves having to scale back or modify their practice? 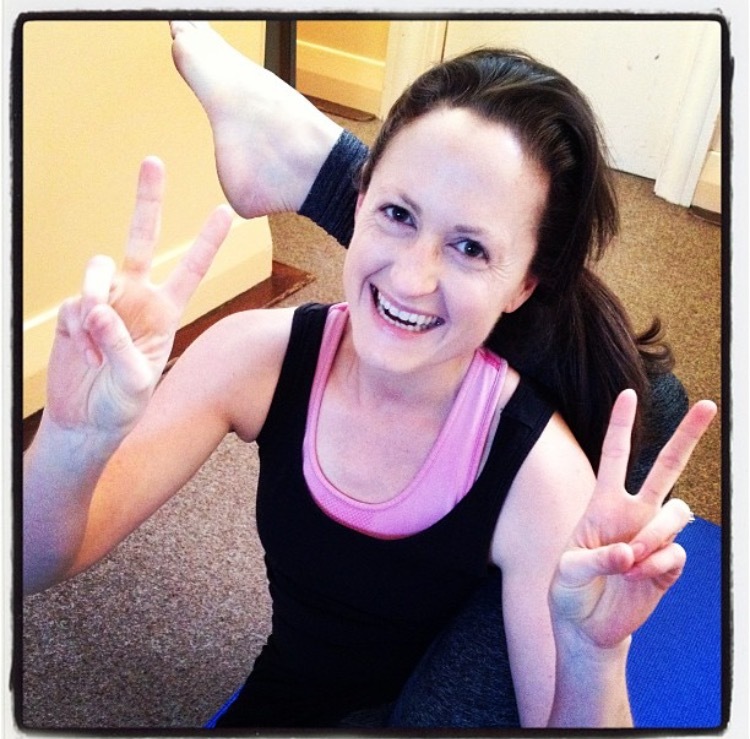 How can we ease the separation that comes with associating progress with asana? Asana is physical, but Ashtanga is all eight limbs. Asana is an important but small part of the teachings. I didn’t personally find it difficult to scale back, but I was not an advanced asana practitioner when I became pregnant. I made the modifications given to me by my teacher and practiced daily throughout both pregnancies. Both were medically textbook, I had no health problems, both my children were delivered at home in water without intervention. Both labours were fast, under four hours. The first was very frightening, I think I went into shock after Camilla was born. The second was probably one of the most powerful and transformative moments of my life. I have since heard the theory that a woman can shed a layer of fear during childbirth if it is a very positive experience, and this definitely happened for me. I found it easier to believe in myself, easier to talk myself into something instead of out of it, after Hugo was born. Post-pregnancy was very different each time. After Camilla I had NO strength, no core, I had lost all sense of myself and of my body. I was overweight and it was like I had never been on a yoga mat before. I really had to start from scratch. I would do one suryanamaskar A then lie down exhausted. I did that three times a week. The next week, I did two suryanamaskar A. Slowly, very very slowly, I built up the asanas one by one, just as I had learned them initially. By the time she was a year old I was back to my full practice and it was stronger and more integrated than pre-pregnancy. When students reach a set-back, for any reason, I tell them this: practice is never linear. If you can find the resilience to just keep going you will figure it out and come through stronger in the end. After Hugo was born it was a completely different experience. I practiced up until the day he was born and started up again when he was five days old. I really felt like I needed my practice - to just do something normal and be myself again. It only took a couple of months to regain even more strength than before. I also quickly overcame one of the biggest practice blocks I’ve encountered - the dropbacks at the end of primary series. Nothing had changed except my ability to believe in myself, to move through and past the fear. It is never about the asana - it’s about what the asana can teach us. Avoiding hard postures, or skipping them altogether, reduces the practice. Don’t deny yourself the chance for transformation. Taking my children to Mysore has been a really important part of practicing yoga for me. 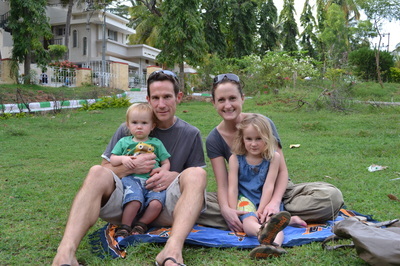 If I ever need to make the trip without them I think it really helps that they have direct experience of India and the shala. It’s all so familiar, just a normal part of their lives. It sounds like a cliche but I feel we have given them something really special through this early experience of the world. Do you find the practice be a spiritual practice (“spiritual” being a universal love, or however defined by the practitioner beyond the physical)? Do you have any thoughts for students if they encounter this transitional point? Yes. Whether the student comes to the practice searching for spirituality or not, I don’t believe it makes a difference. Ultimately it is a spiritual practice and I believe changes people for the better. Don’t be scared of something just because you don’t understand it. Give it time. By all means do Ashtanga to lose weight or build core strength or reduce blood pressure or calm your anxiety. It will do all of those things. But don’t close yourself off to deeper aspects of the practice. You might be surprised. Do you have any final thoughts to share on the practice? Start with, and always come back to, the breath. Full deep breath, linked to movement. Do it daily. Build from there. Find a teacher, a community, tap into it, feed off each other. It’s possible on your own - I’ve done it - but it’s harder. To have a shala with a teacher who cares about you is one of the greatest gifts. Don’t ignore that if it’s available to you. Take it. It’s a real blessing. Cultivate faith: in the method, in your teacher, in yourself. Don’t worry and don’t give up. Don’t take breaks during practice or between practices. It’s a whole lot easier if you just do it, rather than making a choice whether to practice or not. Take all the relevant rest days including moondays, ladies holiday and the same day off each week. This helps stabilise the rhythm of practice in your life. Do the asanas given to you by your teacher. Try your best while you are practicing, be strong when necessary, surrender when necessary. Stay as focused as you can. Then leave your mat and that practice behind. Be a good person, all day. Wake up tomorrow and do it again.